Jetform Swimming Pools has converted half of its 250 domestic and commercial maintenance customers to Zeoclere30 filtration media. Customer demand for more environmentally-friendly, cost-efficient, pool maintenance products has led to Jetform Swimming Pools converting half of its 250 residential and commercial maintenance customers to Zeoclere30 filtration media within weeks of stocking it. 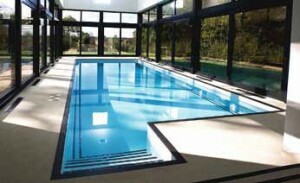 Based in Essex and working all over the London and the home counties, Jetform is an award winning high-end pool construction and maintenance company. “Customers place a high premium on the quality of the pool water, and are keen to try products that are more efficient, especially if they offer financial savings,” comments Keith Saunders, Jetform’s contracts director. “Maintaining pristine pool water is paramount,” Keith adds. “Bather load, filter size and turnover periods affect this. Commercial pools have large instantaneous bather loads which can lead to big increases in combined chlorine. “If the filtration systems are designed properly and have the appropriate flow rates, this can usually be managed but there will still be periods of high levels of combined chlorine,” he says. Zeoclere is beneficial in these situations as it helps to strip these compounds from the water. Although domestic pools have lower bather loads, they have longer turnover periods and smaller filters so any deterioration in water quality can be difficult to rectify. Jetform Swimming Pools has found switching to Zeoclere30 makes sense for customers and for their business. Jetform had to weigh up if its customers would pay extra to use Zeoclere and that, because Zeoclere has a longer working life than sand and would not need to be changed as frequently – what impact that would have on business. Keith comments: “Our research showed that Zeoclere media needs to undergo rejuvenation annually in heavily used pools and this process would replace our traditional pool servicing. “We need not have worried about customer reaction to a higher value product. When we explained the performance benefits and energy savings, so many switched from sand permanently. Keith concludes: “Zeoclere is popular because it delivers improved water clarity, financial and environmental savings arising from less backwashing of heated water and a reduction of chemical usage.